You are currently browsing the tag archive for the ‘in-home’ tag. So I got to thinking, maybe I could offer private letterpress printing lessons. Over the last coupla years, I’ve had people ask me if I could teach them how to use their new press, or if they could come to my house and learn to use mine and see if they should make the commitment to buying a press. (I always wished I could, but my print shop is the size of a postage stamp so two people in there is really hard to maneuver. ) Also, several people I know have presses that just sit unused because they’ve become discouraged trying to teach themselves to print with a press that might just need a tune up, or with type too worn for a crisp print. These are problems a few good Lessons could really help empower New Printer! Here’s what I’m thinking: say you just bought a cute little table-top 3×5 hobby press from eBay for the affordable price of one arm (let’s hope you had the forethought not to pay with your printing arm), one leg and your first born child. It needs to be cleaned up, and you’re just unfamiliar enough with the mechanics of a table top press to want to start taking it apart. That’s where I come in. You send me a message, and tell me you just got this press, and we set up a time for me to come over to your house or studio or class room, wherever the press is kept(its easier to go to it, than bring it to me). I’ll bring with me a small box of supplies in case you’re not sure what exactly you need yet. This way, you can get a good visual of any tools or miscellany you might not have acquired, and some hands on experience with things like quoins and gauge pins. First things first, you will learn the Care and Feeding of your new little Kelsey. We oil and clean, adjust the platen, tighten loose bolts or pins, adjust the rollers, getting quite intimate with the machine. The lessons would be billed by the hour, so we can take as much time as your schedule and budget allow, but for the sake of example, today you only have 2 hours to spare. We get the press clean and moving freely for now, while setting up another date for Lesson 2. Then maybe you’d like to know more Basic Printing, learn some typesetting skills, more vocabulary, make-ready and packing the platen. Perhaps Lesson after that if you want to keep going is getting more in-depth typesetting techniques down, or working on locking up your forme. It can be tailored to what you, the student needs as you progress. Then, one day you won’t need me anymore. *Sniff. *Tear. But I’ll say “So long for now, Good bike, Good bilt, good bauble!” because I’m just terrible with good-byes. You’ll be printing on your own, with hands-on knowledge to get you off on the right foot. 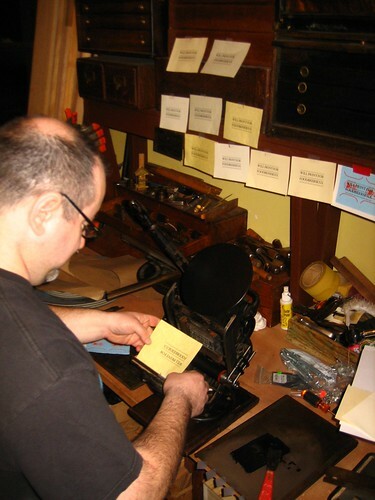 While I’m no Paul Moxon, I do have a bunch experience on Vandercook proof presses, C&P platen presses and a myriad of other table top proof presses so I could help get the ball rolling with more than just your little table top lever presses. I’m imagining all these sessions to be informal and a lot of fun for both of us. Is this something you budding hobbyists would like to have available? I’m sure to get responses about “I wish you were in my area!” and maybe that could be worked out, I don’t know. Maybe I’ll schedule a Tour!